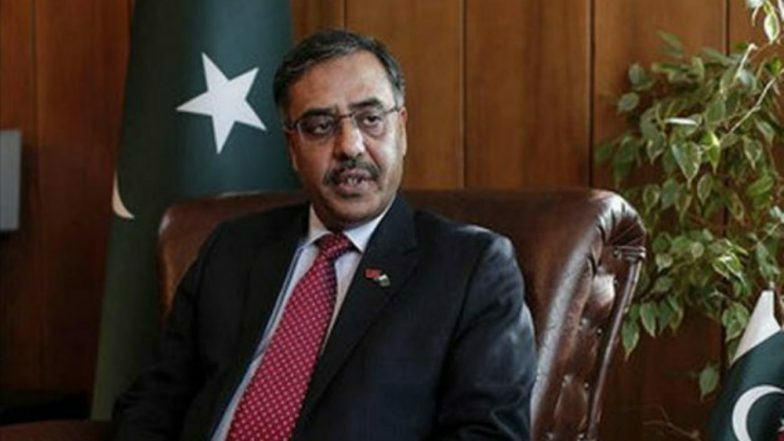 Islamabad, Mar 31: The Pakistan government on Sunday named High Commissioner to India Sohail Mahmood as the new Foreign Secretary of the country. Making the announcement in Multan, Pakistan Foreign Minister Shah Mehmood Qureshi said that the decision was made after consultations with Prime Minister Imran Khan, the Dawn reported. Mahmood is set to replace incumbent Foreign Secretary Tehmina Janjua, who is retiring on April 16 after serving the post for two years. Lauding Janjua for her work, Qureshi said: "Challenges came up in difficult foreign affairs. But she always handled things with courage, bravery, clarity, and with a smile. "Notably, Janjua is the first woman to serve as Pakistan's Foreign Secretary. Terming Mahmood as a seasoned diplomat, Qureshi expressed hope that the former would carry out his responsibilities as the Foreign Secretary. "I am hopeful that he will fulfil the country, as well as the Pakistan Tehreek-i-Insaf's foreign affairs preferences," he was quoted by the Dawn as saying. Mahmood, who currently serves as Pakistan's Ambassador to India, also served as the country's envoys to Turkey and Thailand respectively. Mahmood has diverse experience of bilateral as well as multilateral diplomacy under his belt. He also headed the Afghanistan and West Asia Division as Additional Secretary and was the Director-General in the Foreign Secretary's office.